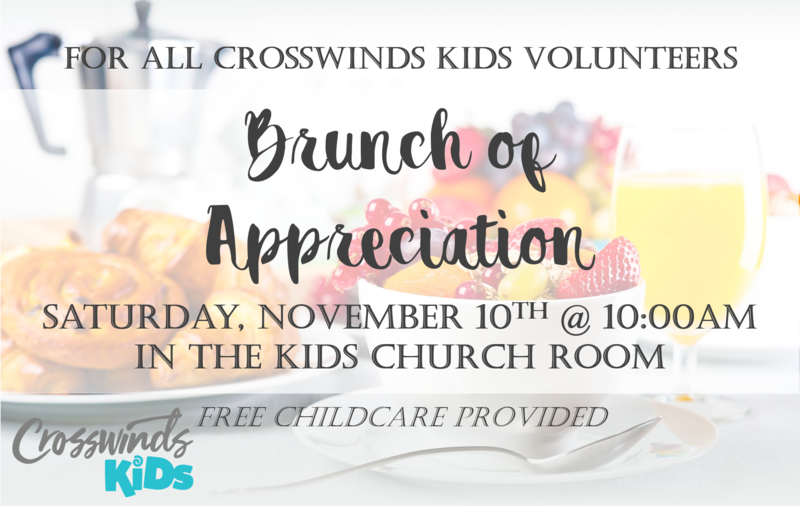 If you are a Crosswinds Kids volunteer, then you are invited to a BRUNCH OF APPRECIATION. We want to personally thank you with a brunch (cooked by Pastor David and children’s ministry staff), gifts, games, prizes, and laughter. You have served and done so much for our children and families at Crosswinds that we want to serve you back! We’ll have free childcare up to 5th grades for your children because we want you there! Please RSVP who’s coming in your family so we can have enough food.